Diamond and pearl platinum estate engagement ring: Description by Adin Antique Jewelry. 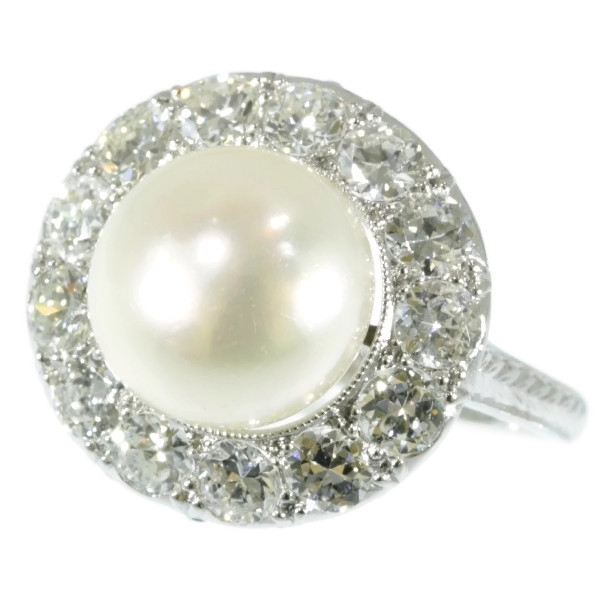 No need to be superstitious about the 13 old European cut diamonds surrounding the grand pearl of this platinum Estate ring from 1930. The rainbow glaze of the pearl, the bright radiance of the diamonds and the swirls of joy in the delicate base will shield you from all of life's misfortune. Style: Between Art Deco and Interbellum - Art Deco is an eclectic artistic and design style which had its origins in Paris in the first decades of the 20th century. The style originated in the 1920s and continued to be employed until after World War II. The term "art deco" first saw wide use after an exhibition in 1966, referring to the 1925 Exposition Internationale des Arts Décoratifs et Industriels Modernes that was the culmination of high-end style modern in Paris. Led by the best designers in the decorative arts such as fashion, and interior design, Art Deco affected all areas of design throughout the 1920s and 1930s, including architecture and industrial design, as well as the visual arts such as painting, the graphic arts and film. At the time, this style was seen as elegant, glamorous, functional and modern. The interwar period (1918–1939) is understood, within recent Western culture, to be the period between the end of the First World War and the beginning of the Second World War. This is also called the period between the wars or interbellum. Total diamond weight: approx. 1.82 crt. Hallmarks: One hallmark "M" and another mark "P", we do not know what these marks stand for.